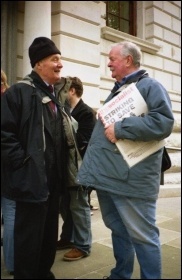 Socialist Party :: After Bob Crow and Tony Benn: We fight on! 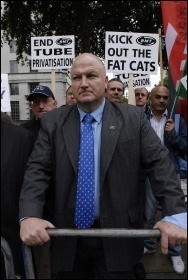 A deluge of tributes followed the sad and shocking death of Bob Crow, elected leader of the Rail, Maritime and Transport union. He was known and respected beyond the ranks of the RMT because the union is to the forefront of militant action. As the Economist put it, "Under Mr Crow, the RMT stood out, forsaking protests for traditional industrial activism." In fact the RMT supported a range of action - demonstrations, occupations as in Vestas on the Isle of Wight, and strikes. Members enjoy, as the BBC admitted, "pay rises every year even during austerity, good pensions and good holiday allowances", prove that combative working class action results. The Economist asks: "What will happen to his union now?" The magazine's pro-capitalist target audience will hope for a 'moderate' successor. Working class fighters will watch carefully, hoping for the election of someone who stands in Bob Crow's tradition. Who the next general secretary will be is for RMT members to decide. In doing so they will be conscious that their union plays a wider and leading role - in Britain and internationally - in standing up for the working class as a whole. The union stands for the working class using its power to defend and extend its rights and share of the world's wealth and for socialist change. The messages of condolence and solidarity from the US, Cuba and elsewhere reflect this wider role. It is immortalised in the RMT banners that carry the words of the traditional socialist and workers' song, 'the Internationale'. 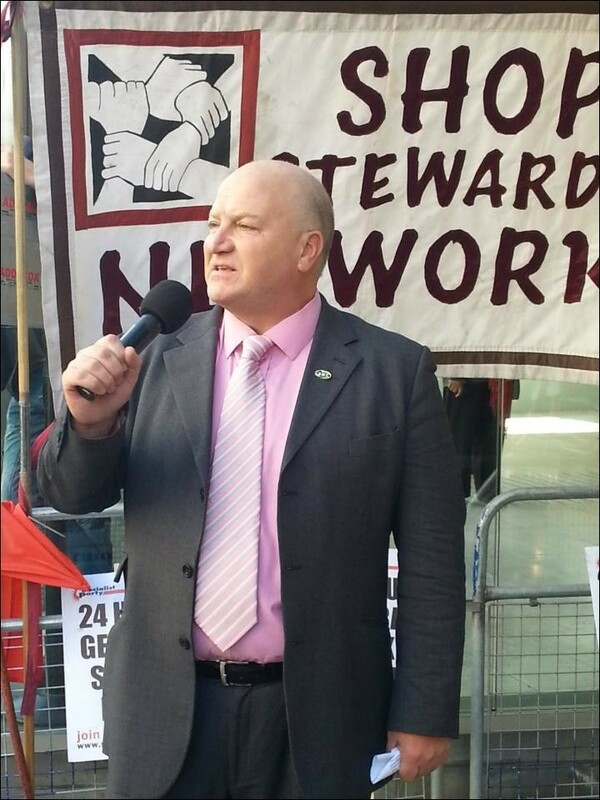 Bob Crow stood for the general resistance of the working class to all attacks. He was central to the RMT's role in establishing the National Shop Stewards Network (NSSN) in 2007. This was a clear recognition of the inadequacy of many right-wing trade union leaders who rest on the 'official structures' and have tended to hold back the movement. The NSSN was an attempt to give voice to the rank and file of the unions. This, of course, cannot be seen as a substitute for transforming those unions, but is a complementary aid to defending members. Against austerity, the NSSN plays a vital role in putting forward a general programme for resisting the government's attacks. 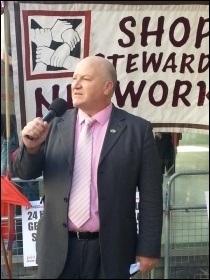 Bob Crow seconded the motion calling for a 24-hour general strike at the 2012 TUC in Brighton. 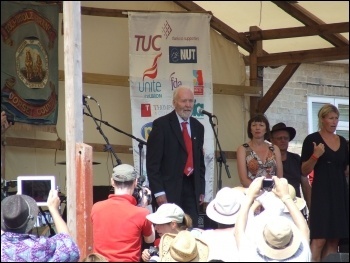 He also moved the motion at the 2013 TUC to keep the 24-hour general strike on the table. The new leader must continue his proposals to build united effective action, including efforts to coordinate with other left unions and leaders. Under Bob Crow's leadership the union also drew conclusions about the need to have a political strategy. A decade ago the RMT was expelled from the Labour Party because it supported socialist candidates in Scotland. Bob and others in the leadership recognised that, in order to defend RMT members and the wider working class, they had to take steps to build a political voice. The union debated the issue at two national delegate conferences and on both occasions backed participation in the Trade Unionist and Socialist Coalition (TUSC). Bob was a co-founder and sat alongside Socialist Party members and others on the steering committee. He also led 'No2EU-Yes to workers' rights', a coalition set up to contest the European elections. There have been innumerable expressions of solidarity with what Bob was trying to achieve, including a willingness to stand in May's elections. The latest batch of local election candidates to be approved by the TUSC steering committee, for example, includes the Finsbury Park RMT branch secretary and an Arnos Grove rep who have come forward just this week as prospective candidates. These London activists see standing as part of their battle to defend jobs and services on London Underground. Eight Portsmouth RMT members have also stepped forward as prospective candidates. But now there could be a danger that the right wing in the generally left RMT may begin to try to undermine Bob's legacy both industrially and politically. What alternative can they offer workers facing privatisation, job losses, and pay cuts? Asking workers to wait for a Labour government in 2015? That is no alternative whatsoever. Labour has shown in words and deeds that it will continue with privatisation, job losses, and pay cuts. Rachel Reeves has warned a Labour government "would be tougher" on benefits than one that has presided over a regime where every two minutes a young person has their paltry benefits stopped. Ed Balls' comment, "We've backed 1% pay restraint," says it all. Labour-dominated councils are decimating services and jobs. They claim to 'feel bad' about it but only a tiny handful of councillors have actually voted against the cuts. And they have mainly been expelled from Labour. The death of Tony Benn is another sad loss to the working class. He was a staunch defender of socialism. But on Labour he was mistaken. The time for equivocation is over - as Bob made clear. Left journalist Owen Jones has commented on the situation after Bob Crow and Tony Benn but offers no way forward. He writes of a "fragmented" left but the real left exists not in little groups or in celebrities like him. The future of the left is in the unions and in the workplaces - organised and as yet unorganised. As wider sections of the working class determinedly take up the fight, as the care workers in Doncaster and the health workers in Ealing are currently doing, new trade union leaderships and the mass political party the working class needs will be forged. Owen Jones says that "the left's real mission is surely hope". But, hope for what Owen? That Labour will be the vehicle to change society? This is not hope. This is utopia. The strategy of Owen and those who want to ensnare the workers and all suffering austerity in the Labour dead end basically amounts to 'a hope and a prayer'. Meanwhile there are springs of real hope as workers draw left and socialist conclusions from their experience of capitalism in the 21st century. In the US the fight for a $15 an hour minimum wage involves young workers who want a share of the so-called economic recovery. In South Africa the working class is taking vital steps to construct a new mass party to continue the legacy of the anti-apartheid struggle, particularly in the form of the Workers And Socialist Party. This pioneering work, with socialists central, recalls Shelley's revolutionary credo: "To defy Power, which seems omnipotent; ... / to hope till Hope creates / From its own wreck the thing it contemplates." 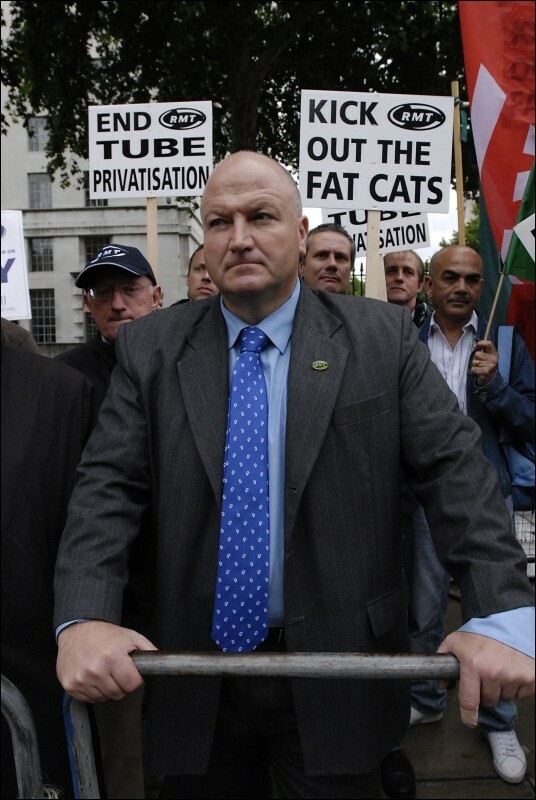 RMT members, by electing a leader who will continue the RMT's role in building both TUSC and determined trade union action to defend the working class at every turn, will be standing in Bob Crow's powerful legacy. And the Socialist Party will back them every step in that direction. The Dross Machine goes into overdrive - Newsnight, Andrew Rawnsley in the Observer, the 'Life of Tony Benn'. A parade of relics of the undead belched out their resentment at Tony Benn's 'destructive' behaviour as a leading Labour Party figure. A smug Neil Kinnock was at his most repellent. Stripped of all the verbiage, Benn's 'crime' was the advocating of socialist policies and having the temerity to stand in the election for Labour's deputy leader in 1982. Naturally, Militant figures prominently in their invective. Andrew Rawnsley in the Observer writes: "For a nice man he kept some nasty company. "He never disowned and stood in the way of dealing with the Militant Tendency and other far-left entryists who were poisoning Labour from within. "He does not bear sole responsibility for the split that led to the formation of the SDP, but he was one of the most crucial triggers for it." For Rawnsley Benn, in advocating the implementation of elements of the socialist Clause 4 of the Party constitution is the 'destructive' element. But the traitors are those who, defeated in the battle for ideas in the Party, fled and formed the Social Democratic Party (SDP). Those who could not stomach the Labour Party embracing socialist ideas included Shirley Williams, one of the gang of four with Roy Jenkins, William Rodgers and David 'I adore nuclear weapons' Owen. In the 1983 general election they stood as a phoney 'left of centre' SDP and divided the Labour vote. The Tory government ruled for 13 years with catastrophic consequences for the working class. Denis Healey, former right-wing Labour chancellor (founder and steering committee member of Bildeburg, the self-appointed organisation of movers and shakers of world capitalism), was also wheeled out posing as a sage of British politics. In reality he was a justifier of nuclear Armageddon and a Thatcherite before Thatcher. "He was a destructive force," he croaked. He meant: 'I was the natural deputy leader, what right did Benn have to stand as well?' In spite of having an election team which included pension thief Robert Maxwell, Rupert Murdoch, the BBC, ITV, the Daily Mail and Express, Healey defeated Benn by a tiny margin of 0.05% of the vote. Healey's political vision was revealed as political myopia when, after Lord Kinnock's treacherous attack on Liverpool council at the 1985 Labour conference, he said to Kinnock: 'by that speech Neil you have won us the next general election.' In the subsequent general elections Labour went down to the two worst defeats since 1931. So these 'destructive elements' gifted the Tories a further ten years of government. The memory of Tony Benn will live in the consciousness of the working class, long after the Labour lieutenants of capitalism in the ranks of the workers' movement are forgotten. "I thought the last lot were bad, but this lot are worse. Yes, I support Keith and Don and what they have done." This was a local resident in Coxford, Southampton, struggling to cope with the hit on her pocket from the bedroom tax and angered at the continuing cuts from the Labour council elected in 2012. All across the Coxford area, Keith and Don have touched the lives of their local community, supporting their stand to Save Oaklands Pool and forcing the council to invest £1.6 million and re-open the pool. Coxford has two representatives who are willing to fight alongside the community to ensure services like Erskine Court, supported living for the elderly, are saved. Keith and Don mobilised hundreds to surround Erskine Court in a determined show of defiance against the council bulldozer and won. When the local Sainsbury's supermarket closed a pathway used by hundreds of people to do their shopping, the community was mobilised and the path re-opened. When First Bus took away a local bus from elderly residents used to get back from the shops, the community was mobilised and the service saved. Now as further blows rain down from the Labour Council with a 10% rent increase, cleaning charges and parking charges digging into people's pockets and the future of Lordshill library under threat, Keith is continuing to mobilise support to save services in the area. In May Keith will stand for re-election to the council. In three years he has shown that he will not betray his promises to those who elected him as others in the Labour Party have done. Alongside side Councillor Don Thomas he has shown what is possible. Let's make sure Coxford keeps its rebel councillors, they are needed now more than ever. Give your support and re-elect Keith Morrell on 22 May. It is deplorable that Guardian columnist Polly Toynbee used an invitation to talk about Tony Benn and his role in politics on Channel 4 news (14 March) to vilify the Militant, forerunner of the Socialist Party. This from the woman who joined the rightward split from the Labour Party, the short lived Social Democratic Party (SDP). She portrayed the Militant, tireless workers for the party, in Lambeth as alien infiltrators. The capitalist media and most commentators and politicians are keen to portray Tony Benn's politics and socialism as outdated and outmoded. On the contrary, Tony Benn was an expert at explaining why socialism is necessary and how it would work. He also clearly explained that capitalism does not work except for the rich. Tony Benn did not draw the wrong conclusions about Labour's electoral failure. The SDP and New Labour decided that it was because it was too left wing. Tony Benn, like the Militant, knew that it was because Labour was not socialist enough. Capitalism tried to draw the sting out of Benn's politics by adopting him as an eccentric uncle. The young woman in Bristol who said that he was her hero, a conviction politician, shows that Benn's ideas will always be relevant and modern. It's a shame that in an article of over 1,600 words Owen Jones couldn't bring himself to seriously discuss the political projects that Bob Crow was actually involved in ('Don't mourn. Organise', 15 March). But perhaps that fits a narrative Owen wishes to promote, that there is no future for any electoral politics outside Labour. Bob, however, saw the creation of a new political voice for working people, rooted in the organisations and communities of the working class, as an essential aspect of the struggle against austerity. For the past four years we had worked together building the Trade Unionist and Socialist Coalition (TUSC), in a project officially backed by the RMT itself. TUSC will stand hundreds of anti-austerity candidates in this May's local elections in the biggest left-of-Labour challenge since the second world war. Despite a number of approaches, Tony Benn didn't agree with an electoral challenge to Labour (though he did appear in the 2009 electoral broadcast for No2EU). I think he should have left the Labour Party, which had so clearly left him, but unfortunately he disagreed. In his latter years Tony was more a prisoner in New Labour, reduced to smuggling out notes through the bars. The socialist policies he stood for were killed off by successive Labour leaders from Neil Kinnock onwards, but they still exist in new projects, like TUSC and No2EU, co-founded by Bob Crow. In his obituary for Bob Crow (12 March), Christian Wolmar states that Bob "was not a member of a political party when he died". However, Bob sat with me on the national steering committee of the Trade Unionist and Socialist Coalition (TUSC), which stands in general and local elections, from its foundation in 2010. Indeed, it was only a few days ago that we were discussing what public meetings he could do to support TUSC's 2014 local elections campaign, in what will be the biggest left-of-Labour challenge in such elections since the second world war. Bob was also the national leader of No2EU - Yes To Workers' Rights, a political party registered to fight the 2014 European elections. He was going to be the lead candidate for London. Bob couldn't have been clearer on the need for working-class people to have an independent political voice, which none of the establishment parties can provide.